WE HAVE THE POWER AND FREEDOM TO CREATE BECAUSE WE ARE ALIVE TO THRIVE! Our ALIVE TO THRIVE Foundation is here to lift others and to create lasting change! This powerful initiative is a dream come true for the Happy Jack Yoga team. “The secret to living is giving” and there is nothing more fulfilling than contributing to the lives of others. Happy Jack Yoga celebrates being ALIVE!! Our revolutionary system fuels passion to inspire students to life changing transformations and to be luminous leaders. Our Alive to Thrive Foundation is our legacy and commitment to create communities where there otherwise would not be the means for it. The Happy Jack Yoga System empowers students to contribute in their own thriving way. Happy Jack Yoga brings leaders and yoga teachers into the world creating a wave of positive change. Our world is in dire need of passionate and committed leaders, who understand themselves first and foremost and are able to act from a place of compassion and wisdom. These are the people we graduate. The truth is that many incredible and inspiring human beings cannot afford the investment for such transformational programs. Help us to make our revolutionary education system more accessible! Previous recipients of our scholarships successfully integrate their experience by supporting individuals recovering from addiction, to cancer patients, to the thriving communities they’ve created and within the public school system. Their impact is international, spanning from North America to Europe! In the past, our scholarships have been out of pocket expenses, and that limited our ability to support our students. With the ALIVE TO THRIVE Foundation we are creating unlimited possibility to experience our Happy Jack Yoga System. JOIN US IN BEING THE CHANGE THE WORLD NEEDS!! Over the past few years, we have awarded the Katie Keates Memorial Scholarships to six passionate & deserving yogis to experience the incredible transformation that stems from attending our programs, even though they otherwise would not have been able to afford it. These scholarships have empowered several students and given them the tools to transform lives! Past recipients of this scholarship in Finland have gone on to successfully integrate teaching yoga to individuals recovering from addiction, who otherwise would not have access to these practices. Our Canadian scholarship recipients have gone on to powerfully share the practices with their communities and within the public school system. Previously with these scholarships being out of pocket expenses, they were limited in their availability. 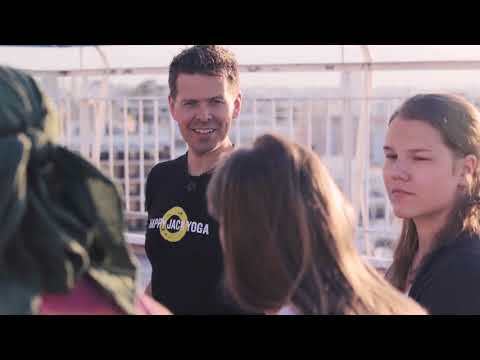 With the Alive to Thrive Foundation we are going to create unlimited possibility for students joining our programs and experiencing our revolutionary Happy Jack Yoga System. Thank you for your generosity and contribution to changing lives!